You’ve made the decision to get a septoplasty. Goodbye, deviated septum! What a relief to know that, soon, you’ll be able to breathe normally, through your nose! No more snuffling, snoring, headaches, or other daily challenges that only someone else with a deviated septum can truly understand. Now it’s time to start preparing yourself for surgery. Knowing what to do before your surgery and afterward will help set you up for success – a smooth procedure and a speedy recovery. You will have to stop smoking, if you’re a smoker, at least two weeks prior to surgery. This applies to marijuana as well as tobacco. You will also have to remain a non-smoker as part of your post-op recovery, so maybe this would be a good time to quit altogether. The reason smoking is banned before surgery is that it constricts your blood vessels. We also recommend that you stop drinking alcohol for the week leading up to your surgery, for the same reason. Exercise is excellent, especially if you don’t exercise regularly. Exercise delivers blood to your brain as well as the rest of your body, so it can improve your outlook as well as your ability to heal. 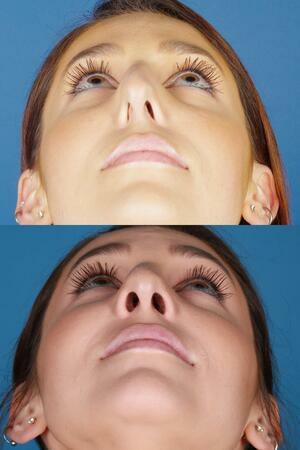 Nose surgery is an outpatient procedure, which Dr. Raval performs at an accredited surgical center. If he is doing only a septoplasty to correct your deviated septum, the entire procedure may take as little as 45 minutes. If you’re having cosmetic surgery to make other changes to your nose at the same time, your procedure might last as long as 4 hours. About an hour later, you’ll be ready to go home. Driving after surgery is not allowed, so someone else will need to bring you to the surgical center and then pick you up. Before you leave the surgical facility, we will give you detailed written instructions that explain what to expect and what to do after you get home. Dr. Raval might recommend that someone stay with you overnight, but that’s not always the case. Depending on the details of your surgery, you will be off work for a few days up to two weeks. Initially, you will have stents inside your nose. These are temporary supports that Dr. Raval will remove in 2 or 3 days. You may have some bruising or swelling, and the area around your nose will probably feel sore, but most patients report little pain after surgery. Any swelling or bruising will go away on its own within a few days, but carefully applying an ice pack or package of frozen peas can help. Your nose will still be congested at first, but don’t be discouraged. This is only because of the temporary stents and packing inside. Do not sniff, just breathe through your mouth for now. Your nose may bleed or run a little. Do not blow it, just use a tissue to dab gently. We highly recommend mild exercise after nose surgery, as soon as you feel ready for that. Again, it’s good for your circulation as well as your morale. Think slow walking. No bending over or heavy lifting, as these movements modify blood flow in ways that can hinder recovery. After a couple of weeks, you can add aerobics, running, or biking. After a month or so, you can get back to your entire routine, no matter how vigorous. The best thing you can do for yourself is to follow Dr. Raval’s orders to the letter. We give you the post-op instructions in writing so you don’t have to try and remember everything. But every item is important. 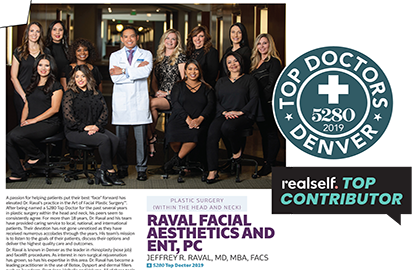 If you try to shortcut the system because you feel pretty good, you risk delaying your recovery or even damaging all that intricate work Dr. Raval just did to repair your nose.